Spring cleaning doesn’t end at the doorway of the home– carry that refreshing mentality straight out to the driveway or garage. Taking pride in your ride is the first step to ensuring it looks good and works well for years to come. If your vehicle’s upkeep has fallen behind, spring is could be the perfect opportunity to get back on track. Keep reading for Park Muffler’s vehicle spring cleaning checklist brought to you by our professional advice. If you own winter tires, don’t waste your investment by leaving them on into the summer– switch them over as soon as the mornings begin to warm up. If you prefer all-season tires, use spring cleaning as an excuse to make sure they are properly inflated and wearing evenly. If you spot any problem spots, have it inspected and repaired immediately. In Alberta, we know the value in keeping our vehicles free of ice, snow, sand, salt and grime– but it is important to keep it going all year round. A washed and waxed finish is more resilient to dust, water spots, pollen, sap and other springtime elements. You can also increase the value and condition of your vehicle by having your interior detailed every spring. In an organized vehicle, everything should have its place– though it can be easier said than done when a long winter means a build-up of hats, coats and other winter gear. Start by removing a few items at a time and deciding what stays or goes for the spring. Consider adding dividers and containers to keep things sorted when you gather your essentials. Spring and summer means two words: road trip! So, don’t let your adventure get derailed by a preventable accident or crisis. Take inventory of your emergency supplies, check your spare tire and anything else that might have been used up over the winter– the batteries in a flashlight, perhaps. Inspections, oil changes, fluid checks, tire rotation– these are things vehicle owners know they should, but don’t always make a priority. Making a habit of booking this service in the spring can keep you on schedule. It also can catch problems that may have developed over the colder months. 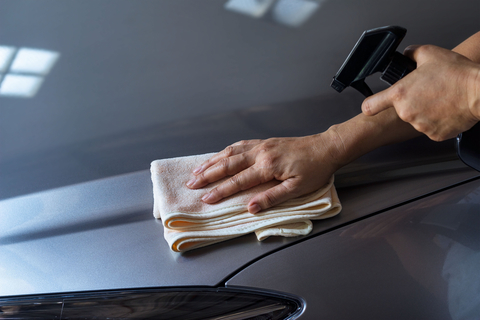 The above checklist is only a summary of vehicle spring cleaning– so visit or contact Park Muffler today for a full assessment and professional advice.